After extensive research and public engagement, City staff are recommending changes to where secondary suites are allowed. 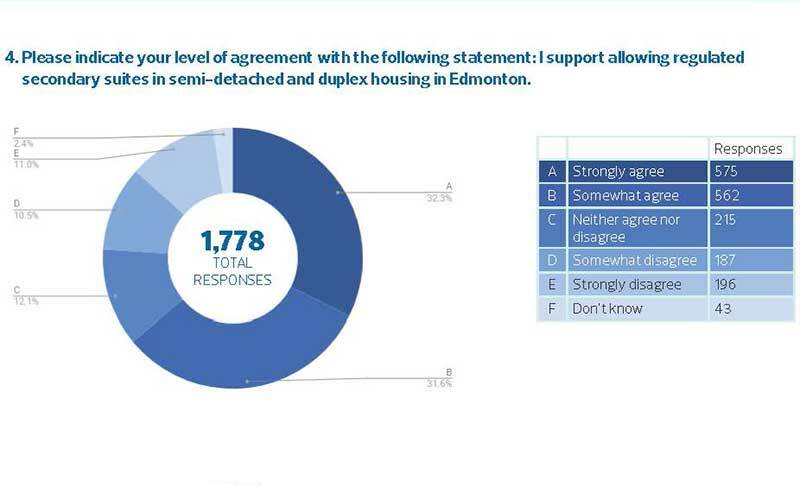 Based on our analysis and feedback from Edmontonians, we think allowing more opportunities for secondary suites will have minimal impact to our neighbourhoods, but will have a big positive impact for individuals by making homes more affordable and providing more housing choices for Edmontonians. This project is currently at the information gathering stage. At the June 21, 2016, Executive Committee meeting, City Council directed staff to prepare changes to the Zoning Bylaw to allow secondary suites in semi-detached and duplex housing. Council also directed City staff to provide information on the minimum site area requirements for all types of suites, and on the possible implications of allowing secondary suites in row housing. As part of the project’s public engagement process, City staff conducted a survey through the Insight Community in June 2017. The survey received over 1,700 responses. Here is how Edmontonians responded. For more details, view the What We Heard report. 3,453 secondary suites have been permitted since the City expanded opportunities for them in single detached housing in 2007. This means that about 1.7% of Edmonton’s 201,463 single detached houses have permitted secondary suites. Here’s where semi-detached and duplex housing currently exist in Edmonton. NOTE: The Edmonton Municipal Census includes fourplex in the same category as semi-detached and duplex, so these figures may be inflated. Different neighbourhoods in the city have had different levels of secondary suite development in single detached houses. If we took the same percentage of single detached homes with suites and applied that number to all semi-detached and duplex housing, we would see approximately 490 new suites across the whole city. We expect that the total number of secondary suites in semi-detached or duplex housing would be relatively small, both across the city as a whole and in each neighbourhood, if they were allowed. The amount of row housing in most neighbourhoods is significantly lower than for single detached housing. If we took the percentage of single detached homes with suites and applied that to rowhousing, we would see approximately 615 new secondary suites. Currently, properties have to be a certain size (360 sq. m or 3,875 sq. ft.) before they are allowed to have a secondary suite on them. This requirement prevents homeowners on smaller properties from adding a secondary suite. We’ve heard that parking for secondary suites is a concern for some people. Currently, secondary suites require one off-street parking space in addition to the parking space required for the main house, unless the suite is close to transit. We are not planning any changes to this requirement. In addition, research has shown that people who live in secondary suites and garden suites typically have fewer vehicles than people who live in houses. On-street parking management programs can also help address areas where there is a shortage of on-street parking, for example by adding time limits.